We recently purchased a metal artifact reduction software for one of our scanners. How does that work? Metals have high intrinsic magnetic susceptibilities (χ) that produce significant local field disturbances with both in-plane and through-plane changes in resonance frequency. By altering resonance frequencies metals shift image pixels away from their true positions leading to significant geometric distortions including signal voids (black areas) and signal pile-ups (bright areas). Several methods for minimizing metal-related artifacts exist. As the important first step in reducing metal-related artifacts, use the lowest field strength magnet possible. Susceptibility artifacts scale with field strength, so you are nearly always better off scanning that total hip replacement patient in that older 1.5T scanner rather than in your brand new 3.0T unit! Even without purchasing specialized software, judicious use of standard techniques can be used to reduce the size of these artifacts. First and foremost, a fast (turbo) spin-echo pulse sequence with short echo spacing should be employed, as the multiple 180°-refocusing pulses applied at close intervals will partially correct for dephasing due to magnetic field inhomogeneities. Receiver bandwidth should also be increased to as large a value as possible consistent with an acceptable level of signal-to-noise. Reducing slice thickness and using parallel imaging acceleration will also help. Before resigning to failure, it is also worth trying to image the area in at least three different planes. I have been pleasantly surprised on numerous occasions that while a metal artifact may make images uninterpretable in two planes, the third plane may be substantially free of artifact and allow a diagnosis to be made. This is purely a trial-and-error method, but may help you when you are in a pinch. Major MR vendors also offer specially designed software techniques to minimize metal artifacts, sometimes called generically called MARS (Metal Artifact Reduction Sequences). Several methods are used to accomplish this goal. Since its development in the 1980's, VAT has become a commonly used and well-established technique for reducing in-plane image distortions due to susceptibility effects. In this method an additional (VAT) gradient is applied during signal readout along the slice-select direction. This gradient results in a "shearing" of the imaged pixels, an effect as though the slice were being viewed at a slight angle. Because the VAT gradient is of equal magnitude to the one applied during RF-excitation, it restores all excited spins within the RF-bandwidth and cancels local off-resonance effects exactly. The VAT method in theory thus fully compensates for in-plane pixel shifts in the readout direction. Although adequately correcting for in-plane distortions, the VAT method produces image blurring due to geometric slice shear as well as the low-pass filtering effect of the additional VAT gradient. These effects can be minimized by using thinner sections, higher matrix resolution, and higher bandwidths. Through-plane (i.e., slice-to-slice) magnetic field distortions due to metal are more challenging to correct. Two closely related techniques have been developed to accomplish this: SEMAC (Slice Encoding Magnetic Artifact Compensation) and MAVRIC (Multi-Acquisition Variable Resonance Image Combination). The SEMAC technique is based on a 2D fast (turbo) spin echo sequence, where each slice is additionally phase-encoded in the third dimension. The additional phase-encoding from overlapping volumes obtained at discrete frequency offsets provides information on how metallic susceptibility effects have distorted the original slice profile. Reconstruction software can then correct for signals shifted perpendicular to the imaging plane. MAVRIC, a GE product, is based on a 3D fast spin-echo sequence and employs a proprietary frequency-selective excitation and multispectral VAT-type readout. The method also includes a deblurring post-processing algorithm to remove artifacts from the reconstruction of imaging planes. Cho Z, Kim D, Kim Y. Total inhomogeneity correction including chemical shifts and susceptibility by view angle tilting. Med Phys 1988; 15:7–11. Hargreaves BA, Worters PW, Pauly KB et al. 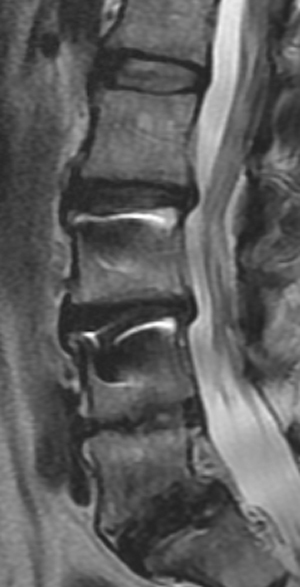 Metal-induced artifacts in MRI. AJR Am J Roentenol 2011; 197:547-555. (A recent excellent review of metal artifacts and suppression techniques). Koch KM, Lorbiecki JE, Hinks RS, King KF. A multispectral three-dimensional acquisition technique for imaging near metal implants. Magn Reson Med 2009; 61:381–390. correction in MRI. Magn Reson Med 2009; 62:66–76. Olsen RV, Munk PL, Lee MJ et al. Metal artifact reduction sequence: early clinical applications. Radiographics 2000; 20:699-712.